Sensitive skin that’s prone to redness needs special care from extra-gentle skincare products. 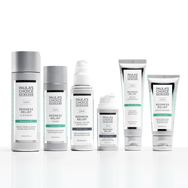 That’s why Paula’s Choice formulated our two CALM collections: Each complete routine (for normal to dry or normal to oily skin) replenishes, soothes redness, renews and refines skin plus provides proven, non-irritating anti-ageing ingredients. Whether you choose one of our CALM collections for normal to dry or normal to oily skin, each fragrance-free product contains a specialised blend of gentle yet effective ingredients that work to calm extra-sensitive skin, even for those with rosacea. What you’ll find in every CALM product are skin-replenishing ingredients such as glycerine, ceramides, and hyaluronic acid (don’t let the acid name scare you; this is one of the most brilliant hydrating ingredients in the world of skincare). Each of these ingredients work to smooth and renew skin’s surface, helping to diminish redness and lessen sensitivity. We also enriched our CALM products with an impressive mix of anti-ageing ingredients that your skin will love. What if you want anti-ageing ingredients, too? Don’t worry, the best and gentlest ones are in all our CALM collections too, so you’ll see more hydrated, radiant, firmer-feeling skin with diminished appearance of lines and wrinkles, too!